I’ve put together a fun list of holiday-themed St. Patrick’s Day crafts for you to enjoy. They’re all easy, and most are simple and safe enough for kids to help with. They mainly involve green things, and leprechauns and shamrocks and four-leaf-clovers – that sort of thing. Lots of fun stuff, including a recipe for play dough. 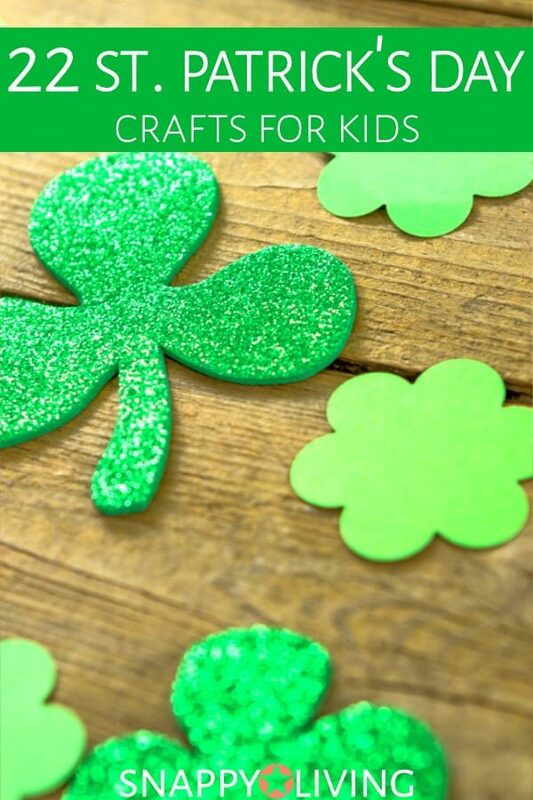 If you don’t have time to make your own 22 St. Patrick’s Day Crafts, you can get some surprisingly affordable St. Patrick’s day party decorations at Amazon. 1. You can make Sparkly Lime Jello Play Dough for kids to make shamrocks and other shapes. 2. Here’s a great way to present candy: Apothecary Jars for St. Patrick’s Day are made with candlesticks and glass jars. 3. These Beaded Shamrocks are made of pipe cleaners and pony beads. Very easy to make, and lots of fun. 4. Crochet Shamrock Garlands are great for decorating and a lot of fun to make. Check out my 42 crochet tips if you need some help! 5. These Lucky Green Painted Jars use leftover food jars you already have around the house and paint from the craft store. 6. This Rainbow Hand Art Craft project is loads of fun. Construction paper, white paint and some gold candy coins are all you need. 7. Hanging Paper Shamrocks are an adorable, safe and easy paper craft. 8. Make an adorable leprechaun yarn bug. This one requires just a few items from a craft store, and is safe enough for older kids or smaller kids with supervision. 9. The St. Patrick’s Day Gold Dig is messy but amazing. You make a bowl full of green shaving cream and hide gold-wrapped chocolate coins in it for the kids to find. You can buy all your supplies at a dollar store. 10. A Paper Chain Pot of Gold is easy to make with paper, and great for decorating. 11. This Shamrock Hoop Art tutorial shows you how to make a miniature embroidery of a shamrock. 12. Print out some St. Patrick’s Day coloring book pages for the kids. These are as simple as loading paper and clicking print, but they keep kids entertained for hours, at a fraction of the cost of coloring books. 13. These St. Patrick’s Day candy rainbows are made from rainbow colored Twizzlers and more. 14. Very cute pipe cleaner shamrock pins from Martha Stewart. So simple, but it does involve a utility knife, so be sure to supervise kids on this one. 15. This St. Patrick’s Day Clay Flower Pot looks like a leprechaun’s hat. Use it as a place card and party favor for kids to take home. 16. Rainbow Sponge Painting can keep kids entertained for hours. 17. This Leprechaun Craft with a Fork Print Beard gives kids an excuse. 18. This little lucky clover pattern is a great beginner’s crochet project. Use it to teach kids how to crochet, or if you’re experienced at crochet, this one will take you no time. 19. Make green-on-green shamrock images using a scratch painting technique. Scratch painting is like magic, as you scratch away one layer of paint to reveal another color below. Once you teach kids how to do this, you’ll have trouble getting them to stop. 20. Make a Celtic cross. This is the simplest cross, but throw in some crayons or markers, and kids have the opportunity to get creative. 21. Make a leprechaun marionette that dances when you pull the strings. This one does involve a needle and thread at one stage, so make sure older kids or adults handle that portion. 22. Go super-simple old school and make a shamrock potato stamp. This one just takes a potato and a table knife to carve into it, so older kids and adults can make the stamps and leave the stamping and decorating to the little kids.